In "By Any Other Name" we are introduced to the Galante and Barsanti families. The families were close at one time, until one tragic day changed their lives forever. For years the families have been at war. Each family waiting for the perfect opportunity to strike to gain control of Manhattan. Genna has been pretty much hidden from the world by her over protective father. Genna has been protected from her father's line of work all her life. She was only a Galante because of her bloodline. She didn't have anything to do with the families' line of work. The same went for Matty. He was sent away after the war between the families began. Most believed he was dead, so when his identity is discovered, people begin to talk. Why is Matteo home? Where has he been? Will be take over the family business? Genevieve "Genna" Galante and Matteo "Matty" Barsanti met unexpectedly when they are trapped on an elevator together. Neither know who the other is. The two of them are trapped for several hours together. They are attracted to each other and once they are rescued they set out to have a drink together. One thing leads to another and the two of them form a connection. When the two of them realize their identities, will they stay away from each other? It has been repeated over and over through the years that they are to hate each other. But with the two of them not having anything to do with their fathers' businesses, will they stay loyal to their families? Can they trust each other? "I don't do things just because they're easy. Despite what you might think, I don't have sinister intentions. I risk coming here, because one of us has to take that risk. One of us has to be willing to take the chance. But if you want me to stay away, if you want nothing to do with me, fine. Just tell me. I'll stay away. You'll never see me again." ~ Matty. Matty needs Genna. Genna needs Matty. Can they two of them be together without risking the others' life? Them being together, will that show that they are disloyal to their family? Will their family respect their decision to love each other? 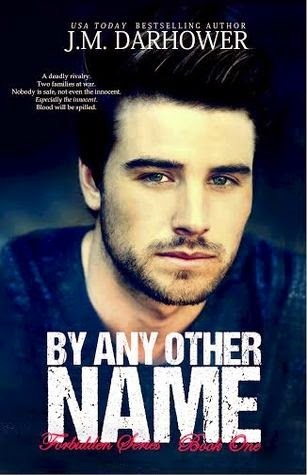 "By Any Other Name is a modern day Romeo and Juliet love story. Two families that hate each other. Two members of their families falling in love with the other. Will Genna choose her family over Matty? Will Matty choose his family over Genna? Will their love cost them their families? Will their love cost them their lives? Can the two of them have a future together? Can their love stop this family feud? Will their relationship add more fuel to the fire? Will their love cost them everything? Both Matty and Genna have protective brothers. Matty's brother is Enzo, who is part of the family's business, his father's right hand man. Dante is Genna's older brother who has looked after her all his life. Dante is involved in his father's business as well. Enzo and Dante hate each other. Both brothers warn their siblings to stay away from the other. Will they listen to them? Will Dante and Enzo accept their relationship? Will Matty and Genna's relationship ruin their relationship with their brothers? "Do you know what they'd do if they saw you here? ""Kill me." His response was impassive. "I don't care. ""You should""Why?" He gazed up at her, raindrops splattering his face and dripping from his washed-out skin. "What do I have to live for? ""Me," she said right away. "Live for me." Two words describe this authors' work. FREAKING AMAZING !!!!! I cannot get enough of her books. J.M. Darhower writes mob books like no other can. You are sucked into her storyline from the first page of the Prologue to the last page of the Epilogue. Every one of her books are a MUST READ. I am a HUGE fan of hers and could read her books over and over. I fell head over heals in love with Matty. I loved his personality. I loved how he cared for Genna. How he didn't give up on her, despite his families' hatred toward her family. I CANNOT wait for the next book in this series. J.M. Darhower left me wanting so much more and I can not wait to see what the future holds for Matty and Genna as well of the other members of their families.... I am dying over here... J.M. Darhower is in a league of her own and with every key stroke on her keyboard she creates another masterpiece that I have to read.